Diane at a recent planning meeting,taking a break. After graduation, I worked for Allison for four years. During that time I married Larry Brock and soon thereafter motherhood began. We had three daughters,Leah(39),Lesley(35)and Lori(33. It seemed everytime I went into the labor room, they were rolling Jeannette Draper out! What a coincidence. Our son,Dean(29) was born in 1974. I worked for Depauw University and IBM and then decided to get my real estate license. Then I worked for Fashion Bug Distribution Center and now Hallmark. My career has been my family. Marie helped me with my degree as a Research Assoc. in the field of Child Development and Human Relations. Peggy Smith helped me with my domestic engineer status. In 1991, after my dad passed away, I found myself "Driving Miss Daisy",my mother,who didn't drive. I found myself absorbed with her life and needs. 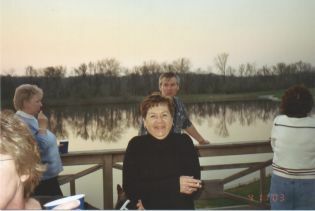 It was during that time that we started boating with all the grandkids(9) and visiting Dale Hollow Lake annually. 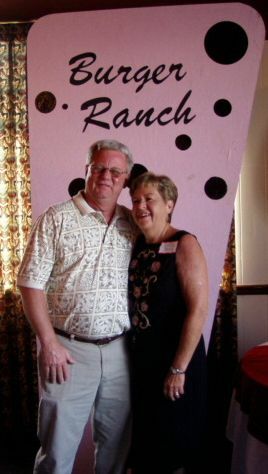 Diane and her husband Larry at the 40th reunion. 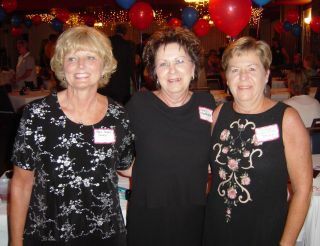 Three beauties,Marie Cochran,Judy Cooprider and Diane.